There's nothing like the joy you feel when the baseball explodes off your bat and soars into the sky. On the flip side there's nothing like the embarrassment you feel when you take a full swing and can't even hit the ball past the outfielders. No bat speed = no fun. Baseball isn't fun when you can't hit the ball out of the infield. 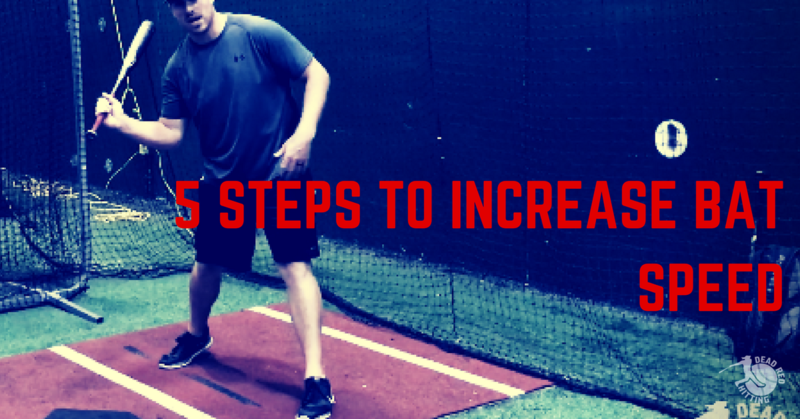 Here are the 5 steps I built my 30 Day Bat Speed Cure Program on to help hitters increase their bat speed. If the hitter's bat speed producing muscles aren't firing explosively then the hitter will struggle to generate bat speed. The swing should be an athletic and explosive movement. Every hitter that generates serious bat speed has explosive and powerful "bat speed" muscles. This is the first step I take because I want to upgrade the hitter's horse power in their swing. You don't need to be able to squat 400 lbs to increase bat speed, but you do need to have your bat speed muscles fire explosively. Most hitters leave plenty of bat speed on the table because they don't maximize the drive from their legs and hips. The hitter needs to fire their hips explosively in the correct sequence in order to maximize their bat speed and power. I'll talk more about sequencing in a second. Many hitters also leave bat speed on the table because they are too spinny with their hips and make a "squish the bug" type of motion. When the hitter squishes the bug or overrotates then they are not delivering the barrel directly into the ball. This creates a glancing blow into the baseball instead of a direct hit. It's key to deliver the hips explosively and directly to the baseball to maximize bat speed and power. Hip separation is a concept most parents & coaches have never heard of. The idea is to expand your hips during the stride in order to create more "elastic" snap with the hips. Many hitters focus on creating separation between the hands and their body, but leak bat speed with their hips. Sequencing is referred to as the chronological unlocking of body parts starting from the ground and working it's way up to the barrel of the bat. In other words - is the correct body part firing at the correct time? If the hands are firing too early or the hips are firing too early then the hitter will lose massive amounts of bat speed. Sequencing is arguable one of the most critical pieces to creating bat speed. When the hitter is too mechanical and lacks athleticism during their swing it can really hurt their bat speed. We want the hitter to be in a reactionary state when they are in the batter's box. The more the hitter is thinking about having perfect mechanics then the less aggressive they will be during their swing. On a beautiful afternoon 25 years ago two hitters played on the same team. Their names were Mike and Scott. These two hitters were very alike. Both undersized and struggled to generate bat speed. They both loved to compete and loved the game of baseball. Both players had dreams of playing in the MLB - as many young players do. The next year Mike's family moved away across the country and the two boys continued their baseball careers. 25 years later Mike was walking through the airport and saw a man that looked exactly like his old friend Scott from his youth baseball team. Mike: "Scott - is that you?" Scott: "Mike! Oh my gosh. It's been AGES since I've seen you! Those years we played together was were some of the most fun of my entire life." Mike: "I know, what a blast we had." Scott: "How long did you end up playing?" Mike: "Well when I ended up moving I landed on a team that really focused on training bat speed. Their coach used this program that helped me increase my bat speed in a really short amount of time. It really boosted my confidence. I ended up starting on varsity for all four years of high school and really enjoyed my experience." Mike: "How about you? How did your playing days end up?" Scott: "Well I ended up getting cut from the freshman team. The coach told me that I just didn't have the pop I needed to play in high school. It was devastating, but I ended up being able to be the team manager. It was really tough to watch them play but I made the most of it." The two men continued to talk and eventually parted ways to catch their flights. One walked away feeling happy as he was looking back at his playing days while the other was embarrassed and had to dig up old, painful memories. As you heard Mike was fortunate enough to end up in with a coach who helped him increase his bat speed. Players who have more bat speed than their competition have more fun, stay on the field, and have a longer playing career. One of the biggest myths that exists in baseball training is that you cannot significantly increase bat speed. Most coaches or parents believe that you are either born with bat speed or you aren't. Carl Henderson, a 12U coach, used The 30 Day Bat Speed Cure Program training program and helped his players increase their bat speed by an average of 5 MPH. While I cannot promise your son or daughter will significantly increase their bat speed from using The 30 Day Bat Speed Cure Program, I can promise that you will find the exercises, drills, and information engaging and informing on the topic of creating bat speed.